We are offering FREE Class 2 digital signature certificate valid for 1 Year and 3 Years to all individuals. These certificates are valid in Government Websites, GST, Tax Filing and Tender Websites. These certificates are provided by https://www.Certificate.Digital, a Licensed Certifying Authority under CCA (Government of India) Simply, acquire a approved USB Device and download your Certificate today. 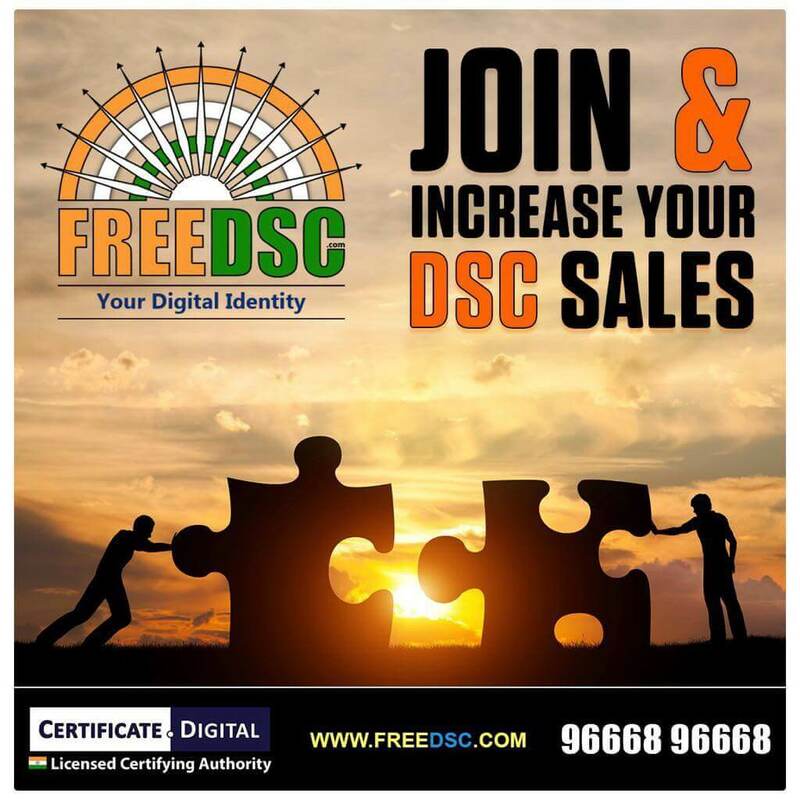 Digital Signature Certificates or DSC or Digital Signature are being adopted by various government agencies and now is a statutory requirement in various applications. Arthsankhya edigital offers different class of certificates to help organization and individuals secure online transactions with legal validity as per the Indian IT Act, 2000. Arthsankhya edigital certificates conform to x.509 standard of Public Key Infrastructure (PKI) in India where in additionally these are issued as per IVG and IOG guidelines issued by the office of Controller of Certifying Authorities. We are offering FREE Class 2 digital signature certificate valid for 1 Year and 3 Years to all individuals. These certificates are valid in Government Websites, GST, Tax Filing and Tender Websites. This is the most popular class of certificates, and most applications would recognize this class of certificates.The verification requirements are (i) Aadhaar eKYC Biometric or (ii) Paper-based application form and supporting documents or (iii) Aadhaar eKYC OTP + Video Verification. The Private Key generation and storage should be in Hardware cryptographic device validated too, FIPS 140-2 level 2. This level of assurance is required generally by Tender portals and some highly sensitive websites. The verification requirements are (i) Aadhaar eKYC Biometric or (ii) Paper-based application form and supporting documents and (physical personal appearance before CA or Video verification) or (iii) Aadhaar eKYC OTP + Video Verification. An E-tokens is a secure hardware device that contains private and public key certificates, and a cache of other certificates. E-Tokens enhance the security of data on public and private networks. E-tokens can be used to generate and provide secure storage for passwords and Digital certificates, for secure authentication, digital signing and encryption. Document Signing now has moved the main stream where now companies are embracing PKI to improve work flow management, accountability, and transparency by using various solutions.We offer Class 2 Document Signer Certificates to organizations in PFX format.The certificate can be used for automation of signing by an organization. The certificate is allowed by the CCA and legally valid. Keeps you updated on the revised GST amendments introduced by the government. It is secure in a way that it does not let anyone access the sensitive information of your company as it is protected by SSL Protocol. Allows you to manage purchase and sale invoices way too easy. The tool can be modified according to the needs of the business firm. Alert system and reminder for all the due payment of invoices. Automatically finds the HSN and SAC Codes applicable on differrent goods.